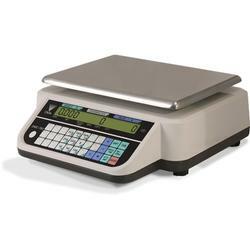 Offering practical solutions for a full range of counting applications, the DC-782 is an affordable option that meets the minimal demands of simple piece counting. The rugged design of the DC-782 allows for reliable weighing in almost any environment, and withstands frequent movement from one area of a plant to another. Its large platter size accommodates nearly any sized product, from the smallest box to large bins of material. Find remarkable precision and accuracy with resolution of 1/500,000. These unquestionable results are viewed with ease, displayed on the DC-782’s backlit LCD display. An optional rechargeable battery allows over 300 hours of continuous use in mobile workstations, outdoor applications, or rental fleets. Programmable ID keys equal quick response time Store an item code, tare weight, unit weight and set point value for up to 25 separate parts. Recall 10 of the preprogrammed settings with the push of a single button. Real-Time Data The standard RS-232 output allows for quick and easy flow of data from your scale to a PC.